Cycle II is now in full swing, and the hilarious captions keep pouring in! The winning caption from yesterday is courtesty of Linda Jane (contact us to learn how to claim your "Ho Jo To Ho" t-shirt) for her comment, "...and when I pull THIS string, it makes his eyebrows go up and down!" The new daily snapshot is here; let the caption-writing commence! "I went to Valhalla and all I got was this silly orange." "Yes! The apple is for you! Now, can you help me find my puppy...?" And if I eat this I turn into a what? You may squeeze my lemon, if I can hold your spear! an apple a day keeps the giant away. 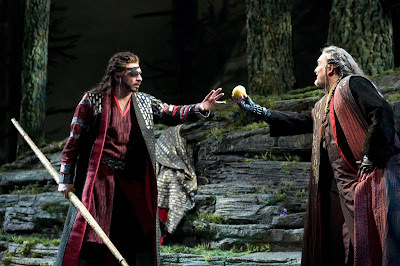 I know this is a Wagner opera but sometimes an apple really is just an apple. "You are getting sleepy...sleepy...hand over the gold right now...."
No, no, no. You carve runes on the SPEAR, you EAT the apple. Yum Yum! A Washington State Golden Delicious! Here, Wotan, use this to chalk up. Wait 'til you see the English you can put on that ball! I TOLD you if you touched that toad you'd get warts! And suddenly, Wotan was able to empathize with Snow White. You hit it with that stick and then run in a big circle while someone tries to tag you with it. Trust me, this game is going to be a big hit next millenium. Listen, if you have to wear gloves to handle that thing, what makes you think I'M going to take it? Are you trying to have us commit the Original Sin? That has already been done heterosexually by Adam and Eve! Snow White accepts the poisoned apple from the Wicked Queen, as portrayed by the Seattle All-Boys Prep School Drama Club. Hold still Loge, you know how bad my depth perception is with just one eye. Fred! You almost forgot to take these UNUSED ROLLOVER MINUTES! "Hocus pocus dominocus, make this peach an apple." "Last time Peter Kazaras gave me this apple, it was terrible: why should I trust you?" PERRY. that is naughty. Now go to your room.